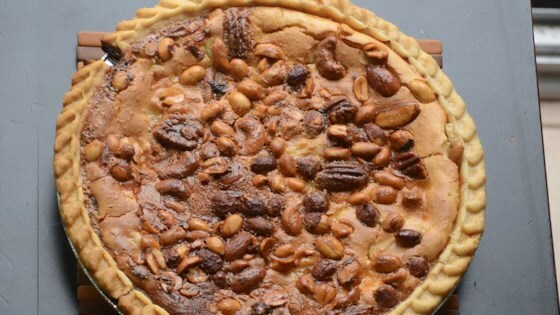 "This is a very unusual pie that blends fruit and nuts in a very tasty combination!" Preheat oven to 375 degrees F (175 degrees C). Blend together the cream cheese, 1 egg, 1/2 cup sugar, salt and vanilla. Gently stir in pineapple, pour into pie crust. Sprinkle pecans over cream cheese mixture. Blend together the 3 eggs, corn syrup, 1/4 cup sugar and vanilla. Pour over pecan layer. Place on lower rack of oven and bake for 40 to 45 minutes or until center is firm. This pie is Amazing! I entered it in a contest and won 1st place! Very good! The flavors are wonderful. I have made this several times, and the only problem I had was that it is enough for two pies. It also had to cook a bit longer as well.